Looking for the perfect team building activity for your office, whilst also making a huge difference to the life of our refugee chefs? 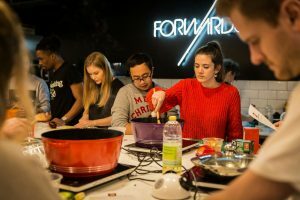 Book a Migrateful cookery class! Why choose a Migrateful cookery class for your office? We will bring all the cooking equipment to your office building – meaning your staff don’t need to travel! All we need from you is a big table to lay out the induction hobs and a sink to wash up our equipment at the end of a class. Preparing and sharing a meal together is a great way to get people in the office talking to one another and learning to work as a team in a fun and informal setting. Shelling beans, peeling potatoes and chopping tomatoes with someone new are surprisingly effective ways to get to know them. A Migrateful class will achieve all of the usual objectives of team building activities: it requires skills such as communication, collaboration, trust, delegation and sharing. In contrast to more traditional corporate activities though, a Migrateful class applies those skills to a real and useful task (cooking) whose end result (a delicious meal) is tangible and directly reflective of the strength of its team. The class involves a minimum of 8 participants in a workshop led by the refugee chef. If you want to involve a bigger group we can do two classes at the same time or have more colleagues join after the class to enjoy the meal after it’s been prepared. The model is flexible according to your needs. The fee for the cookery class will go towards paying for our weekly chef training which offers an invaluable community and support network for our refugee chefs and helps them to improve their cookery teaching skills. For more information please email bookings@migrateful.org.